Electricity is needed for basic farm tasks, such as lighting and heating, but also for complex tasks like irrigation pumping. It’s important to recognize the potential dangers associated with electricity. Casual use of electricity often leads to accidents, sometimes fatal ones. If you are working with power tools, check all the parts and that all the connections are secure before each use. Extension cords are used extensively on farms. From powering tools to powering machinery, extension cords see a lot of wear and tear. Check your extension cords constantly for frays and exposed wiring. 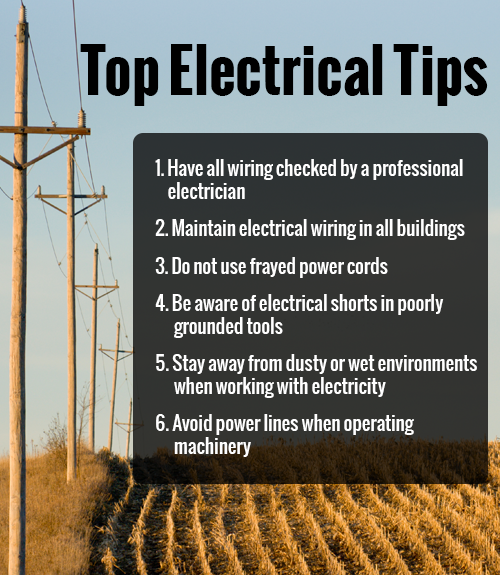 Take special care to remove unnecessary hazards when working with electricity. Many farm environments are rough on electrical systems. When possible, mount fixtures and boxes away from dangerous surroundings, including animals, dust and weather elements. Humidity in confinement houses or milking facilities can destroy electrical boxes quickly. In corrosive environments, it is best to use underground cables to prevent damage to wiring. Cover all electrical components with watertight covers to prevent accidental electrocutions. To prevent an electrical accident with equipment or wiring, it is important to lockout all power boxes during maintenance routines. If you encounter an electrical issue, contact a qualified electrician. Fuses and circuit breakers are designed to handle specific loads. When a fuse blows, do not replace it with a larger fuse than necessary to handle a bigger load. A fuse that is too large for the circuit will not protect against an overload, and can often cause fires. Driving equipment under power lines is an everyday occurrence. Be aware of where power lines are located and avoid them when moving large equipment. If you intend to do any excavating on your property, check with the Missouri One Call System first to prevent accidents caused by digging up electrical lines. Missouri law requires that a locate request be placed before excavation. Never use frayed power cords. Power cords are used extensively on farms. From powering tools to powering machinery, extension cords see a lot of wear and tear. Check your power cords constantly for frays and exposed wiring. Maintain a safe working environment. It is very important to have a safe working environment, especially when working with electrical equipment. Take special care to eliminate unnecessary hazards. Many farm environments are rough on electrical systems. Humidity in confinement houses or milking facilities can deteriorate electrical boxes very quickly. Light fixtures, wiring and boxes can be damaged by animals or machinery bumping into them. When possible, mount distribution panels away from dangerous surroundings. Put extra thought into the location of your circuit boxes, locating them from away from possible animal abuse, dust, and weather elements. To prevent an electrical accident with equipment or wiring, it is important to lockout all power boxes during maintenance routines. If you encounter an electrical issue, contact a qualified electrician. Use appropriate fuses and circuit breakers. Fuses and circuit breakers are designed to handle specific electrical loads. When a fuse blows, do not replace it with one that is larger than necessary for the circuit to handle a bigger load. A fuse that is too large for the circuit will not protect against an electrical overload, which can often cause fires. Protect wiring from the elements. In corrosive farm environments, it is best to use underground electric cable to prevent damage to the wiring. Cover all electrical components outside with watertight covers to prevent accidental electrocutions. Inspect power tools regularly. If you are working with power tools frequently, be sure to check all the parts and make sure all the connections are secure and that the power cord is not frayed. Stay away from power lines with machinery. Driving equipment under power lines is an everyday occurrence on most farms. It is necessary to be conscious of where power lines are located and to avoid them when moving equipment requiring high clearance. Always turn off and lock out power boxes during maintenance. To prevent an electrical accident with equipment or wiring, it is important to lockout all power boxes during maintenance routines. Be aware of underground power lines. If you intend on doing any excavating on your property, be sure to check with the Missouri One Call System to prevent any accidents by digging up electrical lines. Missouri law requires that a locate request be placed before beginning any excavation.